We scarcely need the calendar to confirm that summer begins on Saturday, June 21. Area residents who have survived a few other Junes at Lake Chapala recognize the signs that mark the days until the short night on Midsummer’s Eve and the longest day of the year as summer officially begins. 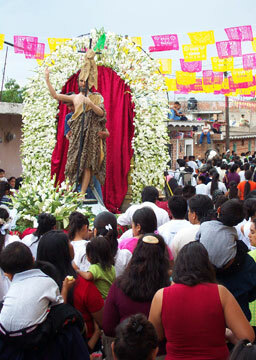 First there were the nine days (and nights) of the patron saint fiesta in San Antonio Tlayacapan. There the religious celebrations and parties accelerated to a frenzied finale on June 13. Before the sizzle of the skyrockets and the riotous clamor of the bands, processions, carnival rides and dances could fade from memory, the promised summer rainy season began, in earnest. The thunder has been rolling across the heavens (sometimes loud enough to drown out any leftover skyrockets) all week and the heavy rains in Guadalajara have filled the city’s streets and tunnels with floodwater. With dozens of streets impassible and the crunching of fender benders echoing between thunder claps, one observer noted that Plaza del Sol had turned into an enormous swimming pool. Meanwhile, three short days after the culmination of San Antonio’s big celebration, the village of San Juan Cosalá kicked off their own novena honoring the June 24 feast day and birthday of St. John the Baptist. While it is sometimes said that San Antonio’s town party is the most raucous, the event in San Juan Cosalá is often called the most traditional of the patron saint celebrations on Lake Chapala’s north shore. Other area villages, including San Juan Tecomatlan, east of Chapala, and San Juan Evangelista which is on Lake Cajititlan were also named for John the Baptist and they will also mark the feast day in their own way and with their own festivals. Sandwiched between these nine-day fiestas is the scarcely known three-day feast for the patron of the congregation in La Canacinta. This year the folks there are raising funds to begin building their own chapel which will be dedicated to the (Corpus Cristi) the Body of Christ. This is a moveable feast – the date is hinged to the date on which Easter is celebrated. Always a Thursday, Corpus Cristi was marked this week, on June 19. Join the fun, enjoy the rain and cooler days and nights, and enjoy the long first day of summer.